In March 1993 (Boy, am I ever getting old.) I was called to serve in the Austria Vienna Mission serving in the small country of Slovenia. About the same time I was called to serve, my alter ego, Elder Alex Van Dyke, was popping up in my sketches. In a burst of creativity between my call and my report date to the MTC, I created a series of strips that followed Van Dyke from the time of his mission call to the doors of the MTC. Quite proud of myself, I set the dozen, or so, strips aside and promised myself to keep my ears open for funny things on my mission and pick up the strip when I came home in two years. After receiving my mission call and while waiting for the MTC, I drew a series of strips that for the most part were eventually redrawn and included as the first ten or so strips of “Mission Daze.” This strip never made it after I decided that Elder Van Dyke should serve in a mission not my own. When I entered the MTC in early June 1993, I left my color pencils, felt tip pens, and sketch books at home. I figured cartoons weren't appropriate for a missionary. That lasted about five minutes. Soon the margins of my Missionary Guide were populated with bug-eyed characters. And then one P-Day, a singular event in the history of "Mission Daze" took place. 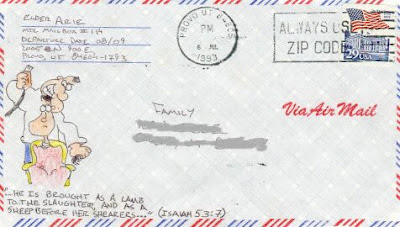 After closing the envelope to the weekly letter home, I drew a picture of my alter ego to the left of my family's address. It was a big hit with my family as well as the missionaries in my district. Over the remaining weeks of the MTC, the pictures got more and more creative. This is what my letters home from the MTC looked like. As you can see, the format limited what I could do. What you can’t see is my family’s address—I don’t want you bombarding them with hate mail. When I arrived in Slovenia, the weekly comic strips moved from the outside of the envelope to the inside. This allowed me the freedom to create more detailed gags as I didn't have to worry about working around addresses, stamps, and the other stuff that usually goes on the cover of an envelope. Every week without fail I included a strip with my letter to my family. Over the two years I was in Slovenia, I sent home nearly 100 gags--a couple of which were actually funny. Upon arriving home from my mission, I decided to give the mission strip a go. If I was able to come up with a gag every week during my mission, then maybe I could do a daily strip. I worked feverishly my first summer back and by the time I had to go to school in the fall; I had fifty or so strips drawn. I had just gotten Elder Van Dyke out of the MTC and into the field when I decided that I had enough done that I could start looking for someone to pick up "Missionary Man" (that's what I called it at the time-a name I was never completely satisfied with). After a couple of run-ins with unresponsive newspaper editors, I came to the conclusion that there wasn't a market for a comic strip about an LDS missionary. Meanwhile life got a lot more complicated. School started and I found it a challenge to keep up on my studies and my art. Ultimately, I let my art slide instead of my studies. I set aside Elder Van Dyke for some time. Years went by during which I met and married my wife, graduated from BYU with a master's degree, got a job, and became a father. Through it all, though, there was this nagging feeling of unfinished business--leaving Elder Van Dyke stranded in Laputania forever as a greenie was somehow cruel. I found the initiative to return to Elder Van Dyke the months leading up to my little brother's mission. I resolved that in addition to writing him a letter each week, I would include a week's worth of strips. That way, I would be forced to see Elder Van Dyke's mission to the end. As I explained to my little brother in my first letter to him in the MTC, I finally found an editor that would publish my stuff--me. By the time I finished chronicling Elder Van Dyke's missionary journey from mission call to home coming, I had drawn over 500 strips. During the process, I mustered the courage to begin submitting gags to the New Era. Those gags led to future submissions to the Friend, several published books, apps, and ultimately this blog. 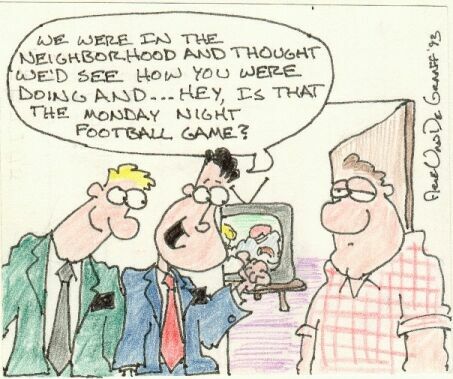 Someday, I hope to present these missionary comic strips in chronological order the way I always intended them to be. In the meantime, I'll continue to publish them once a week shotgun style on this blog. Really they'll let you put just about anything on the Internet, won't they? Thank you for the missionary comics. I currently have a son on a mission, two nephews along with three additional past early morning Seminary students of mine and think of them often. Having the ability to send them a strip that would apply to them has brightened their day and mine! Arie, I absolutely LOVE your missionary strips! I post them on the wall of our mission office where I am now serving as a senior sister. The missionaries come in and immediately look to see what is up there next! Thanks so much for your wacky insight into the lives and hopes of our young missionaries. God Bless you! Just discovered your missionary strips a couple weeks ago & I've been collecting them to send to our son who will soon be leaving for Reynosa Mexico! Keep up the great gags, we love them! Your comic strips are fabulous and I love sending them on to my two grandsons and nephew who are serving in Denver, Virginia and Peru! Thanks for helping me give them some appropriate humor. Keep up the great work!